Sisters Darianne, 16, and Yerianne Roldán, 17, moved from Puerto Rico to Orlando with their family for school. Yara Ramos oversees dismissal at SunRidge Middle School. Conchita Santiago, a principal in Puerto Rico, speaks with Javier Melendez, director of human resources at Orange County Public Schools, at the welcome center for Puerto Ricans at the Orlando airport. 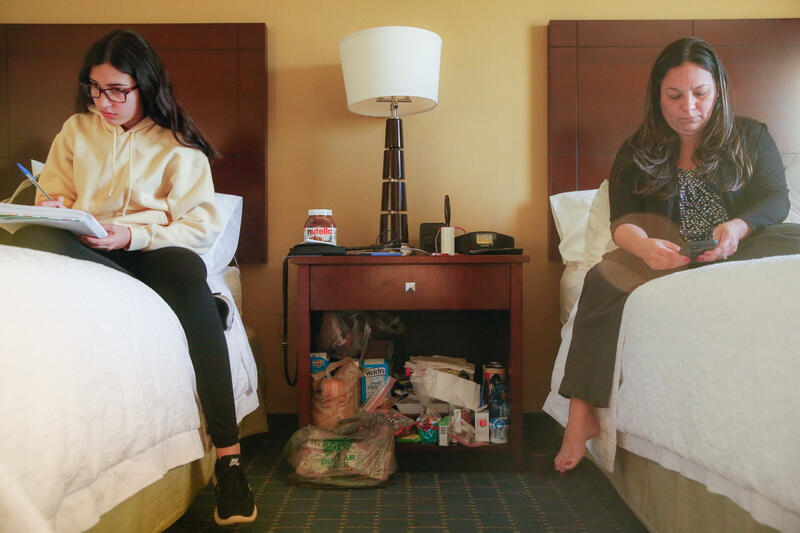 Darianne and her mom, Yesenia González, in their hotel room by the Orlando airport. Sharing one room has been hard, says Eliud Peña, the girls' stepdad. 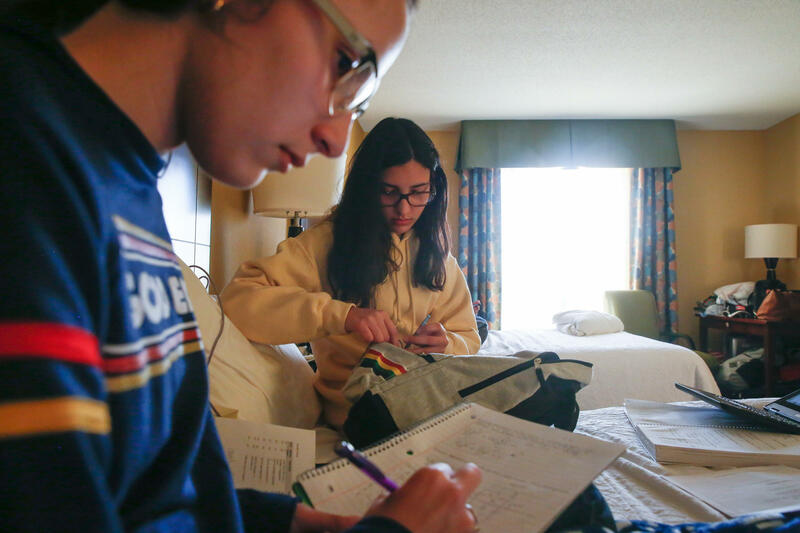 The Roldán sisters do their homework on the bed in the hotel room they share with their mom and stepdad. (Top left) Spanish teacher Johanna Lopez. (Top right) Yerianne Roldán, 17, in class at Colonial High School. 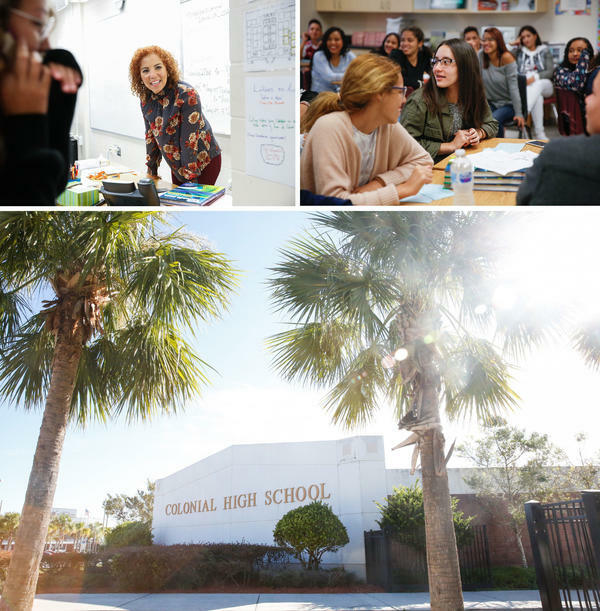 (Bottom) Colonial High School in Orlando has already enrolled nearly 100 students from Puerto Rico and the Virgin Islands. 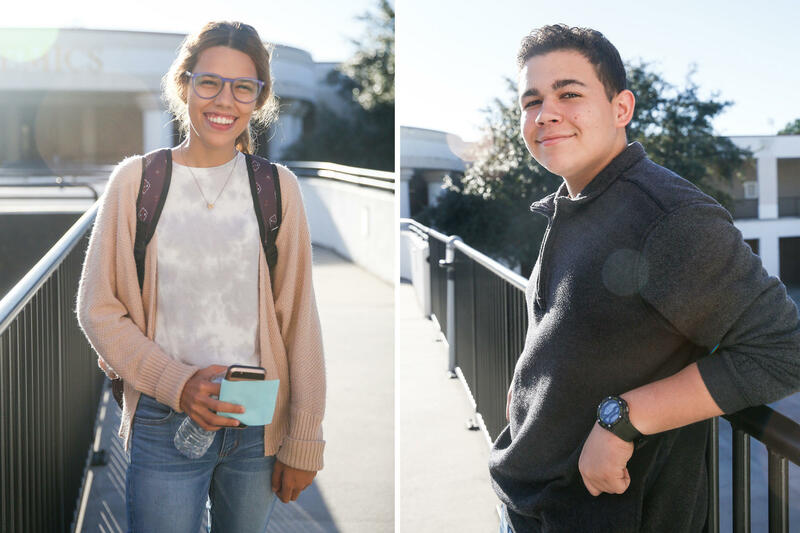 Zuleyka Avila (left) and Oxzuen Casta Rodriguez (right) are both students at Colonial High School who came from Puerto Rico after Hurricane Maria. Yara Ramos is a veteran teacher from Camuy, Puerto Rico. She arrived in Orlando with her four children. SunRidge Middle School in Winter Garden, Fla., where Yara Ramos works as a paraprofessional. It's 5:30 a.m. and dark in the fifth-floor hotel room, just a few minutes' drive from the Orlando airport. There are still 20 minutes before the entire family needs to be downstairs to enjoy the free breakfast in the hotel lobby, then they'll be driving the 15 minutes north to school — first period starts at the "very early" time of 7:20. 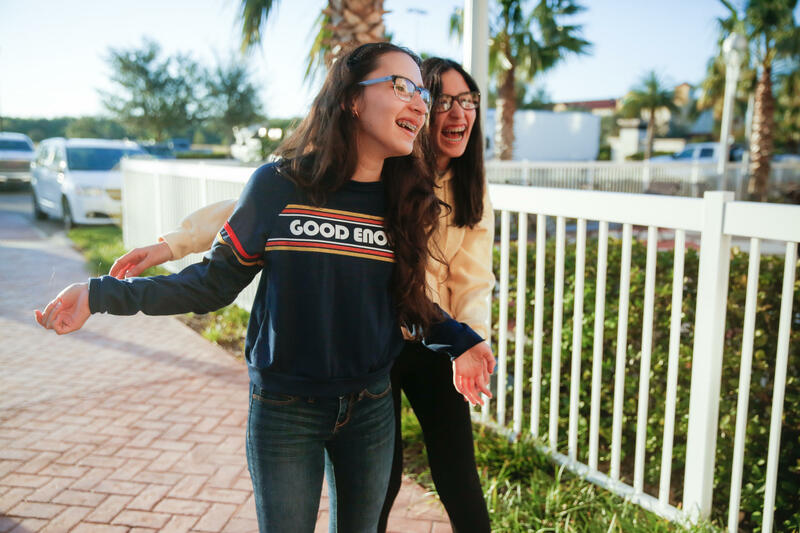 This has been the daily routine for nearly two months since Yerianne Roldán, 17, and her sister Darianne, 16, arrived in Orlando from western Puerto Rico in the aftermath of Hurricane Maria. They're staying in this hotel room with their mom, Yesenia González, and their stepdad, Eliud Peña. Their hotel room is bright and clean — and pretty standard, albeit for the food stashed under the bedside table, and the piles of suitcases and random belongings stacked in the corner. "This is a new experience and if you don't have experiences you don't have a life," Peña says. He brought the family to Orlando because he has family in the area. "It's a story for the girls to remember forever; they can tell their children one day." It's a story the girls would definitely rather tell than live through. Yerianne, the older, more reserved sister, says they're still coming to terms with their new reality. "We only had an hour to say goodbye to our families," she says. "I'm just really worried ... most of my family are elderly." Yerianne's younger sister Darianne says the first days here were the hardest. "In my mind, I was like, 'OK, this is only temporary. I'm only going to stay here for a month and then I'm going back.' " But that's not what happened. This is my life now, she says, scrolling through pictures of her new school friends on her smartphone. Darianne celebrated her 16th birthday in the hotel — the cleaning staff made a three-tiered "cake" out of towels and room service left a slice of chocolate cake. Their family is not alone: Schools in Orlando have enrolled nearly 2,000 Puerto Rican students who've fled the storm-ravaged island. Most don't know when or if they'll ever go back. Their stories are heartbreaking. Their future in limbo. The district in Orlando has tried to make the process as smooth as possible, waiving documents necessary for enrollment and assigning kids to schools. And still, Orange County public schools superintendent Barbara Jenkins says she has gotten angry calls about taking in Puerto Rican kids. "They thought we were talking about immigrants," she explains, "but these are citizens of the United States and they are welcome here and we will take every last one of them into our classrooms immediately. They are our children. We will never run short on compassion." That compassion runs deep at Colonial High School, where Principal Jose Martinez has already enrolled nearly 100 students from Puerto Rico and the Virgin Islands. That's where the Roldán sisters are enrolled. More than half of the 240 faculty and staff members there have family ties to Puerto Rico — including Principal Martinez. That's why every chance he gets, he reminds the students: "My family was you, my grandparents were you, my cousins were you. And though you may be leaving some of your family behind, you're carrying them with you in your hearts." And it's a welcome reminder — because the students who recently arrived in Florida are still pretty shaken up. Many of them share their first period of the day together — a class taught by Spanish teacher Johanna Lopez. One of their assignments is to present their short-term goals to the class. Many have similar agendas: Get good grades. Join the soccer team. Apply to college. Zuleyka Avila, 17, starts her presentation off with a nervous smile. She wants to go to college, and one day become a pediatrician. She's still wishing she were back in Puerto Rico, but after living in Orlando for the last few weeks, she's not sure if she ever will. She says her mom doesn't want to go back. She feels lost. Alone. Oxzuen Casta Rodriguez, a fellow student, knows exactly how that feels. He's just not sure he wants to show it. "I don't want to feel overwhelmed," he says. "I don't want to be in an emotional stress all the time." And that feeling of being overwhelmed is slowly subsiding, the students say. At Colonial, there's a spirit week that culminates in homecoming, events that slowly make the students feel connected to the school community. On Halloween, Darianne, who is sharing the hotel room with her family, even dresses up in costume — posting photos with her new friends on Snapchat. "If you're living somewhere and there's an earthquake, hurricane, tornado or some kind of disaster, you might think you're in despair," explains Rebekah Felix Lambert, who came from Río Piedras, Puerto Rico. "But there will always be help there. Something good is going to come out of the bad." In order for the district to support the influx of new students, it needs more staff. 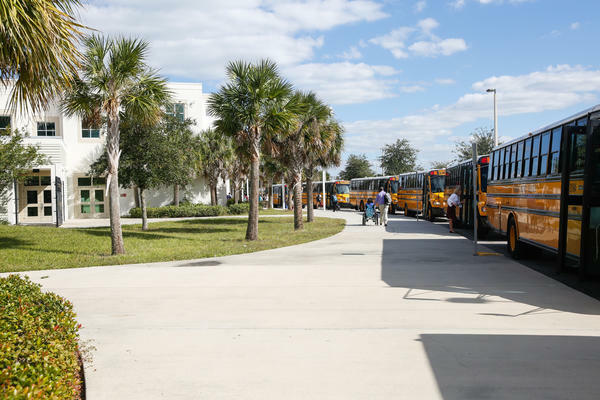 It's a natural progression then, that as many adults leave their homes on the island and come to Florida, the school district has been at the airport — literally — hiring them as they arrive. So far, Orlando has hired 51 people, including classroom teachers, paraprofessionals and bus drivers — all from Puerto Rico. Because so much of the island is still in the dark — less than half of the island now has power — many recent arrivals still can't retrieve copies of their teaching credentials, proof of employment or transcripts from where they earned their teaching degree. "We'll be creative in hiring them," says Jenkins, the district's superintendent. "That might mean they could start as a substitute teacher until we find those credentials or gather what the state requires for their license." 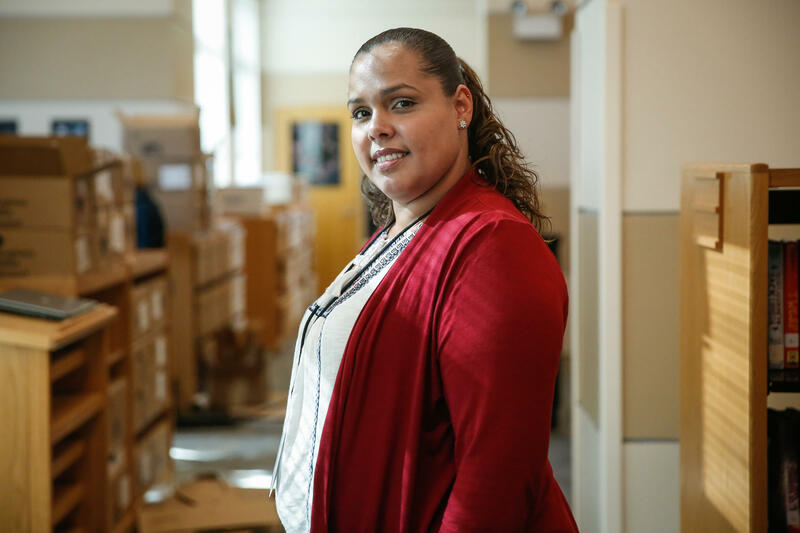 Like many teachers who left Puerto Rico after Hurricane Maria, Yara Ramos applied for a job at the airport, next to empty ticket counters in a once-vacant terminal. She's a veteran teacher from Camuy, Puerto Rico, who arrived in Orlando with her four children, still ambivalent about her career. "I miss my people," she says, crying. "They've been my co-workers for over 10 years. It's family, too ... my classroom, it's probably there the way I left it, with everything packed in bags — all my computers were sealed." She pauses for a moment, "I'm not coming back," she says, trailing off. She's waiting for her relatives back home in Camuy to send her the documents she'll need to be hired as a licensed classroom teacher. In the meantime, she's starting over again as a paraprofessional at a middle school just west of downtown Orlando. That's despite her 10 years of teaching experience. And yet, it's a full-time job, which means she can move out of her brother's house — where she has been living for more than a month — and start putting her life back together again. 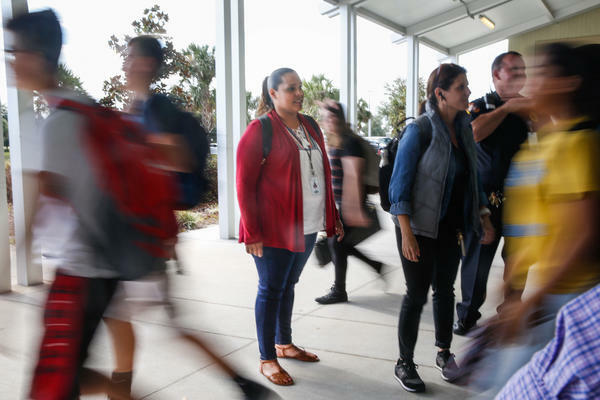 As Ramos settles in, the Orlando school district is bracing for a second and third wave of students and teachers from Puerto Rico. The message will be the same as it was two months ago: Our doors are open. Schools in Orlando have enrolled nearly 2,000 Puerto Rican students since Hurricane Maria hit the island. Most don't know when or if they will ever go back, and it's taking a toll on everyone. NPR's Claudio Sanchez reports. 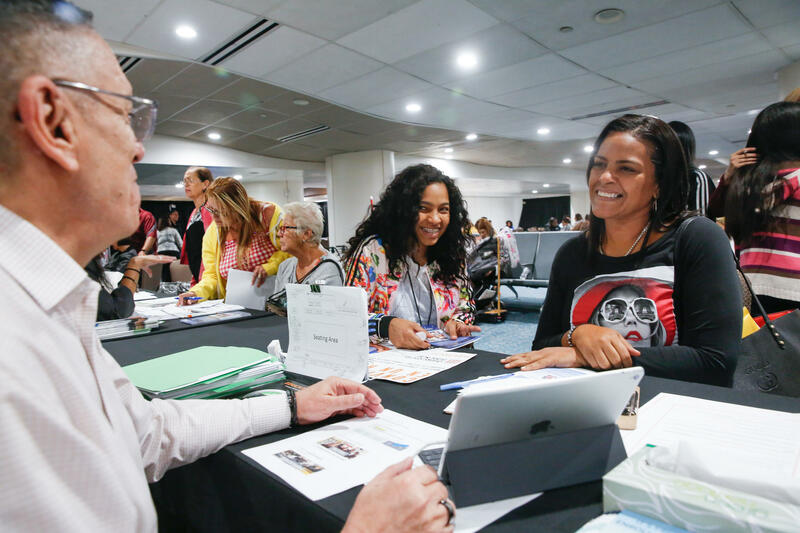 CLAUDIO SANCHEZ, BYLINE: The first stop for Puerto Rican kids and their families when they arrive in Orlando is a couple of tables the district has set up at the airport to register them for school. SANCHEZ: Parents and guardians are told they'll eventually need to produce school transcripts, medical and immunization records. But because most left Puerto Rico with just the clothes on their backs, the district is waiving these and other requirements and assigning kids to schools anyway. Still, school superintendent Dr. Barbara Jenkins says she's gotten angry calls about taking in Puerto Rican kids. BARBARA JENKINS: They thought we were talking about immigrants. And we said these are citizens of the United States. And they are welcome here. And we will take every last one of them into our classrooms immediately. They are our children. We will never run short on compassion. JOSE MARTINEZ: ...My family was you. My grandparents were you. My cousins were you. And you all have a story. And although, you may be leaving some of your family behind - you may be leaving them behind, but you are carrying them with you in your hearts. SANCHEZ: Martinez clears a table in his office and brings in five recent arrivals from Puerto Rico. YERIANNE ROLDAN: We only had an hour to say bye to our families. SANCHEZ: Yerianne Roldan is 17. SANCHEZ: For Yerianne's younger sister Darianne, the first few days were the hardest. DARIANNE ROLDAN: In my mind, I was like, OK, this is only temporary. I'm only going to stay here for a month. And then I'm going to go back. And, like, I kept on waiting, but we never really got that call that we were going to go back. SANCHEZ: Zuleyka Avila, 17, says she wants to return, but she's not sure if Puerto Rico will ever recover. Zuleyka, a senior, had plans to attend college and study medicine in San Juan next spring. But her mom doesn't want to go back. Zuleyka says she feels lost, alone. SANCHEZ: I know exactly how that feels, says 16-year-old Oxzuen Casta Rodriguez. He just doesn't want to show it. OXZUEN CASTA RODRIGUEZ: I don't want to feel overwhelmed. I don't want to be in emotional stress all the time. SANCHEZ: The group grows quiet. REBEKAH FELIX LAMBERT: I would like to say something. SANCHEZ: Rebekah Felix Lambert, a shy 16-year-old from Rio Piedras, Puerto Rico, says she has some advice for anyone who wants to listen. LAMBERT: If you're living somewhere and there's an earthquake, hurricane, tornado or anything, some kind of disaster, you might think you're in despair. But there will always be help there. Something good is going to come out of the bad. SANCHEZ: They all nod in agreement. It's lunchtime at Colonial High. The students say goodbye and fade into the crowd. Claudio Sanchez, NPR News. (SOUNDBITE OF AGNES OBEL'S "SEPTEMBER SONG") Transcript provided by NPR, Copyright NPR.